We propose a lexical account of event nouns, in particular of deverbal nominalisations, whose meaning is related to the event expressed by their base verb. The literature on nominalisations often assumes that the semantics of the base verb completely defines the structure of action nominals. We argue that the information in the base verb is not sufficient to completely determine the semantics of action nominals. We exhibit some data from different languages, especially from Romance language, which show that nominalisations focus on some aspects of the verb semantics. The selected aspects, however, seem to be idiosyncratic and do not automatically result from the internal structure of the verb nor from its interaction with the morphological suffix. We therefore propose a partially lexicalist approach view of deverbal nouns. It is made precise and computable by using the Montagovian generative lexicon, a type theoretical framework introduced by Bassac, Mery and Retoré in this journal in 2010. This extension of Montague semantics with a richer type system easily incorporates lexical phenomena like the semantics of action nominals in particular deverbals, including their polysemy and (in)felicitous copredications. The research of Livy Real is funded by a CAPES PhD grant, and benefited from a stay at LaBRI and from funds from ANR project Polymnie. The research of Christian Retoré was done while on CNRS sabbatical at IRIT (Toulouse) and benefited from funds from ANR projects Polymnie and Loci. We are indebted to Christian Bassac (University of Lyons 2), Marcos Lopes (University of São Paulo), Urszula Wybraniec-Skardowska (University of Opole), and to the anonymous referees for their helpful comments. Jacquey, E. (2006). Un cas de polysémie logique : Modélisation de noms d’action en français ambigus entre processus et artefact. Traitement Automatique Des Langues 47(1), 137–166, http://www.atala.org/Un-cas-de-polysemie-logique. Lefeuvre, A., Moot, R., Retoré, C., Sandillon-Rezer, N. F. (2012). Traitement automatique sur corpus de récits de voyages pyrénéens : Une analyse syntaxique, sémantique et temporelle. In Traitement Automatique Du Langage Naturel, TALN’2012, vol. 2, pp. 43–56. http://aclweb.org/anthology/F/F12/. Moot, R., & Retoré, C. (2012). 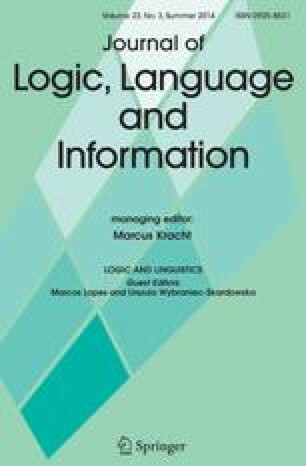 The logic of categorial grammars: A deductive account of natural language syntax and semantics, vol. 6850.LNCS Springer, http://www.springer.com/computer/theoretical+computer+science/book/978-3-642-31554-1. Pierrel, J. M. (2006). Le trésor de la langue française informatisé : Un dictionnaire de référence accessible à tous. Revue de l’association des membres de l’Ordre des palmes académiques. 17, 25–28. http://halshs.archives-ouvertes.fr/halshs-00398661. Retoré, C. (2012). Variable types for meaning assembly: A logical syntax for generic noun phrases introduced by ”most”. Recherches Linguistiques De Vincennes 41, 83–102. http://hal.archives-ouvertes.fr/hal-00677312. Retoré, C. (2013). Sémantique des déterminants dans un cadre richement typé. In Morin E, Estève Y (Eds.) Traitement automatique du langage naturel, TALN RECITAL 2013, ACL anthology, vol 1. pp. 367–380. http://www.taln2013.org/actes/.